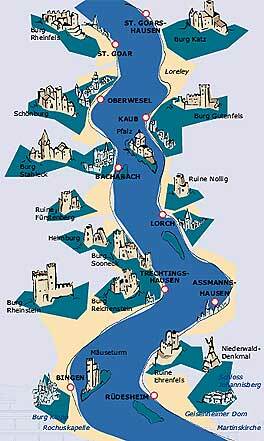 Enjoy the Rheinsteig and the world cultural heritage site Middle Rhine River from a different point of view! I recommend a Rhine river trip on a boat to St. Goar. From Assmannshausen, take the boat at 9:40 a.m. to St. Goar (passing the Lorelei rock), in St. Goar you have 3 hours to discover the town. 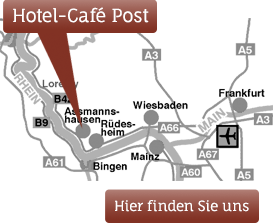 At the hotel “Goldener Lowe” you can take the Bummelzug * (slow excursion fun train) to the fortress and castle Rheinfels. 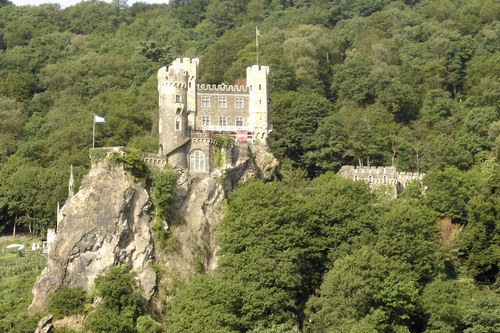 You can tour the fortress and from the castle, you have a unique view overlooking the Rhine river and the Lorelei rock. At 2:10 p.m. you board the boat again and drive upstream in direction Assmannshausen and then reach the wine town Bacharach at about 3:10 p.m. What a beautiful and introspective wine town – with very old half-timbered houses and winding alleys. 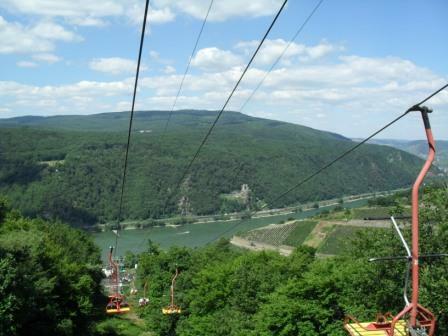 You have 2 hours to tarry in Bacharach and take the next boat at 5:10 p.m. to Assmannshausen on the Rhine river. The boat landing stage is about 200 m from the hotel Cafe Post. You can get the boat ticket from us. Price for the boat ticket about 17.50 EUR (round trip ticket). This boat trip will be an unforgettable Rheinsteig experience for you. 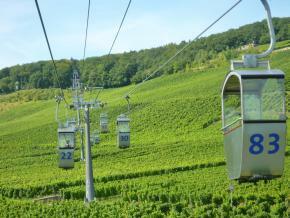 You’ll arrive in Assmannshausen at about 6:15 p.m.
You can use the Assmannshäuser cable car to the Jagdschloß. 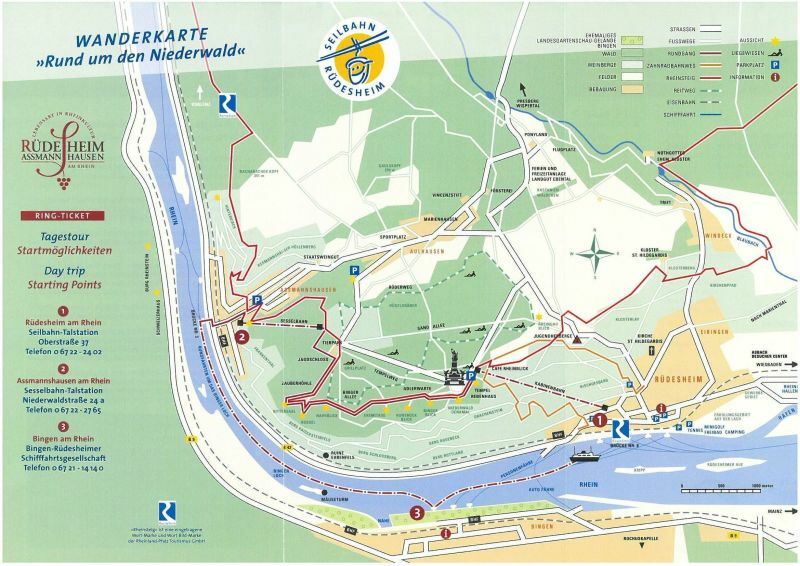 From the Jagdschloß you can take a walk through the forest with beautiful viewpoints to the Niederwald monument. On Niederwald monument you can catch the cable car to Rudesheim. In rüdesheim they can stroll through the Drosselgasse. From Rüdesheim, take the boat to Bingen and to Assmannshausen!